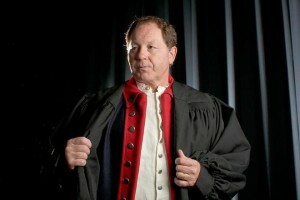 In the past few years, Dan Fisher has traveled the country presenting the messages “Seven Lies We’re Being Told About America” and “Bringing Back the Black Robed Regiment”. “Seven Lies” is a presentation that address the attacks being launched against America’s Christian heritage by the “politically correct” progressives. It proves beyond a “shadow of a doubt” that Christians founded America – not atheists and deists, and that the Founders wanted a country where Christianity would have a strong impact – not a country where faith and government would be divided by a “strict separation of church and state”. Dan is known as a leader in the modern “Black Robed Regiment” movement in America and has given his, “Bringing Back Robed Regiment” from Boston to Montana. In this presentation, Dan gives the history of American pastors during the Revolutionary War and shows how they were the primary force in the fight for liberty. He shows that the British so hated these pastors that they gave them the title of the “Black Robed Regiment”. In this message, Dan illustrates how that, had it not been for the preachers’ strong stand in the 18th century, America would probably never have come to be. He proves that if today’s preachers do not return to the faith of the Founders and begin to take the same stand as the preachers of the Revolution, America may not survive. Dan believes that America is facing a crises today much the same as the one faced by the country in 1776. He says it is time for preachers of America to respond to God’s call and fully engage in the culture war that is destroying our liberties and will eventually, if not checked, steal away our religious liberty and our opportunity to freely preach the Gospel.